Authors: David J. Bacon, Sambatra Andrianomena, Chris Clarkson, Krzysztof Bolejko, Roy Maartens. First author’s instution: Institute of Cosmology and Gravitation, University of Porstmouth. What do sizes of galaxies have to do with cosmology? The authors explore “Doppler lensing”, the modification of the observed sizes of galaxies due to their peculiar velocities, as a probe of cosmology in this paper. They develop and present techniques that will be useful in the future to understand our Universe better through Doppler lensing. Consider the following example. There is an overdensity of matter and several galaxies in and around it. Galaxies that are pulled in by the overdensity acquire some velocity towards its center. In the figure below, you can identify three galaxies: A, B and C. A sits at the center of the overdensity and it has a physical size S. B and C are infalling into the overdensity, and they have the same physical size as A. (Why am I talking about physical sizes? Since the Universe expands, there are several definitions of distances in cosmology.) Because B is falling away from the observer, it appears red-shifted by the Doppler effect, or at higher redshift than it really is. C is moving towards the observer as it falls, appearing blue-shifted, or at lower redshift than it truly is. Consider for a moment that the amount of red-/blue-shifting makes the redshifts of A, B and C to appear to be the same, and that all three galaxies have the same physical size. Compared to typical galaxies at the redshift of A, B will look larger and C will look smaller than those galaxies. To the left, there is a diagram of a system of three galaxies with the same physical sizes. Galaxy A is at the center of the overdensity and galaxies B and C are infalling. To the right, we depict the system as we would observe it: peculiar velocities change the redshifts of galaxies B and C and B looks larger than a typical galaxy at the redshift of A. This figure is a modified version of Figure 1 in Bacon et al. So what do sizes of galaxies have to do with cosmology? If this effect were measured, it would provide information about the velocities of galaxies. Because these velocities develop due to the infall towards overdensities, the sizes of galaxies can be related to the properties of density fluctuations and they could enable tests of theories of dark energy, the energy behind the accelerated expansion of the Universe, and modifications to General Relativity. Another mechanism that relates the observed sizes of galaxies to the properties of our Universe is magnification. Magnification is the apparent change in size of a galaxy because a matter overdensity that is along the line to that galaxies behaves like a lens. 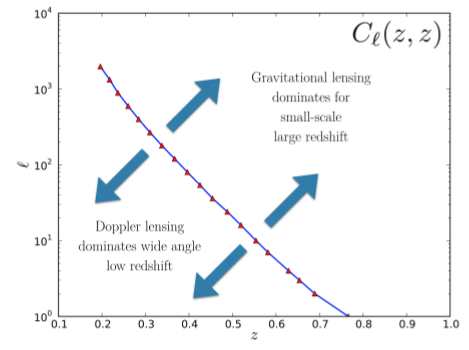 Magnification and Doppler lensing have opposite behaviors: for a galaxy behind an overdensity, Doppler lensing reduces its apparent size, while magnification increases it. Both effects also change the apparent brightness of galaxies. The separation between the regimes in which Doppler lensing and magnification become important. The x-axis is redshift and the y-axis is inversely proportional to angular separation. Figure 2 of Bacon et al. The authors explore the combination of both effects to understand which one is more important. The result is the plot shown to the right. The x-axis is redshift and the y-axis is inversely proportional to the angular separation between two galaxies. The line, which symbolizes where one effect cancels the other, shows that at low redshift and large separations, Doppler lensing is more important than magnification in determining the observed size of a galaxy. When studying the large scale structure of the Universe, it is a common tool to build “correlation functions“. Correlation functions tell you, for example, what the probability is of finding two galaxies separated by some distance. This probability depends on how the matter in the Universe is distributed and on the composition of the Universe. “Correlations” measure how related those two observables (the positions of the pair of galaxies) are. In Doppler lensing, correlation functions can be computed that relate, for example, the position of a galaxy (representing the overdensity) to the size of a second galaxy (the one infalling into the overdensity) as a function of the distance between them. The authors use cosmological simulations to predict what these correlation functions would look like if measured by future surveys, and to predict what constraints could be set on the cosmological parameters that describe what our Universe is made of. For example, Doppler lensing is sensitive to the nature of dark energy (described through its equation of state). Doppler lensing can give us information about the components and evolution of the Universe by indirectly probing the peculiar velocities of galaxies. We only covered some applications of Doppler lensing in this post, but with many other potential applications suggested by the authors, the future of cosmology is magnified.